The best way to understand pivot table is to see one. Start with the following Figure. This figure shows a portion of the data we have used creating the pivot tables in this chapter. 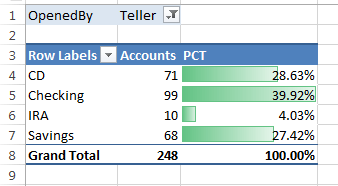 1) What is the total amount of new deposits, broken down by account type and branch? 2) What is the daily total new deposit amount for each branch? 3) Which day of the week generates the most deposits? 4) How many new bank accounts were opened at each branch, broken down by account type? 5) What’s the dollar distribution of the different account types? 6) What types of bank accounts do tellers open most often? 7) How does the Central branch compare with the other two branches? 8) In which branch do tellers open the most savings accounts for new customers? How does the Central branch compare with the other two branches? The following figure gives us our desired Pivot Table. 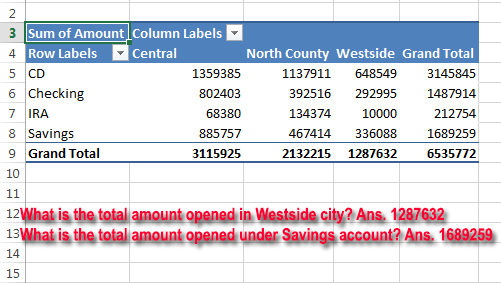 From this Pivot Table, we can find out easily grand total of amount opened in Westside branch. The pivot table is in “PT1” sheet. We have changed the sheet name to “PT1” after the creation of pivot table. This time we shall place Amount field in VALUES area, Branch field in COLUMNS area, and Date field in ROWS area. The pivot table is in “PT2” sheet. We have changed the sheet name to “PT2” after the creation of pivot table. To get this pivot table, we shall place the Weekday field in ROWS area and Amount field in the VALUES area. 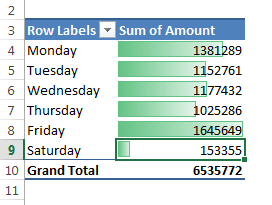 We want to use conditional formatting to the data range B4: B9 to make you understand easily which day is making more deposits. To do this select cell range B4: B9 and choose Home ➪ Style ➪ Conditional Formatting ➪ Data Bars ➪ Gradient Fill ➪ Green Data Bar. The pivot table is in “PT3” sheet. 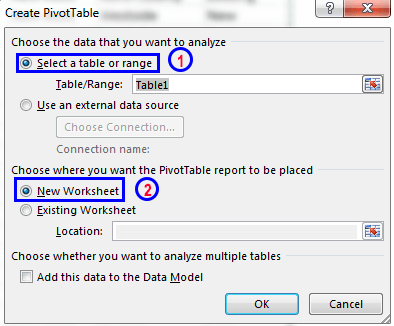 We have changed the sheet name to “PT3” after the creation of pivot table. Using conditional formatting, we have made this pivot table more understandable. To get this pivot table, we shall place Amount field in VALUES area, AcctType field in COLUMNS area, and Branch field in ROWS area. 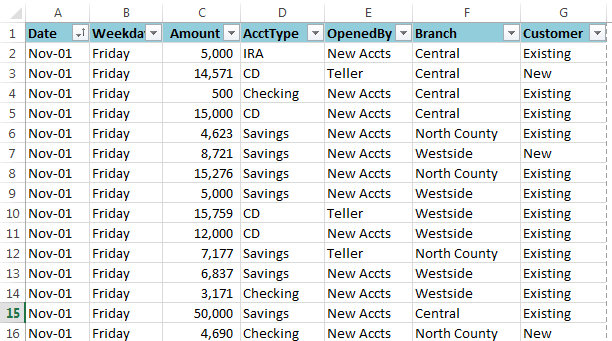 You will get a pivot table, but this one shows the total amount of deposits, broken down by account types and branch like our first created pivot table. We have to change some options to get our required one. 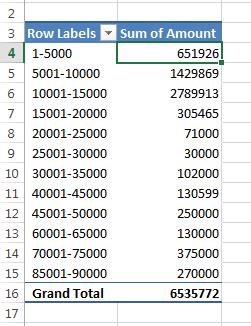 Right-click on any value of the pivot table and then use the following figure to change the option. After selecting the Count option, our pivot table will look like this. Pivot Table with count values. The pivot table is in “PT4” sheet. We have changed the sheet name to “PT4” after the creation of pivot table. Dollar distribution means, say you may want to know how many accounts were opened in the range of 1-5000. In our example, total 712 accounts were opened, among them, 253 accounts were opened in the range of 1-5000 range. In percentage, we can say about 35.53% accounts were opened in 1-5000 dollar range. We shall create a pivot table showing all the dollar distributions. 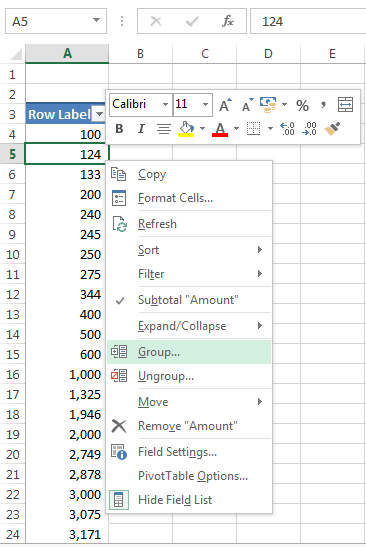 At first place the Amount field in the rows section at the bottom of the PivotTable Fields task pane. This will create a figure like this. 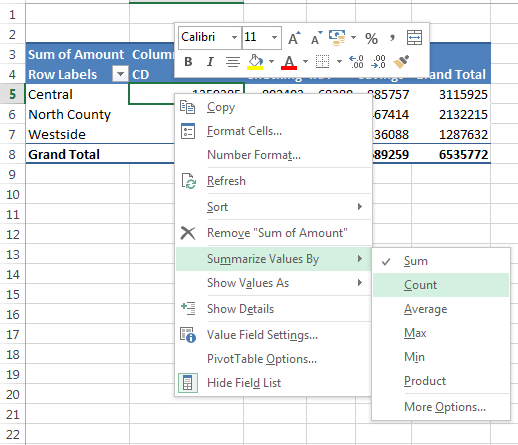 Right-click on any value in the pivot table, a shortcut menu will appear. 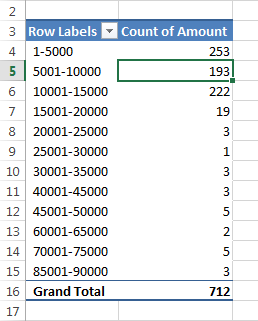 When Amount data is placed in Rows section, data is placed ungrouped. To make data in the group, click the Group option as per this image. Select Group from the options, Grouping dialog box will appear. Enter 1, 100000, and 5000 in three fields respectively. 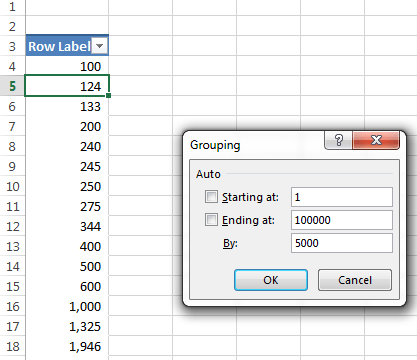 Grouping data with the help of the Grouping dialog box. Click OK, your pivot table will look like this. Data are grouped in ranges. Place the Amount field again in the Values section. The pivot table will look like this. Pivot table summarized as Sum. We have to summarize our pivot table by Count. To do this, right-click on any values, a shortcut menu will appear and choose Summarize Values By⇒ Count. Your pivot table will look like this. Repeat what we have done in step 2. Another same column will be added. 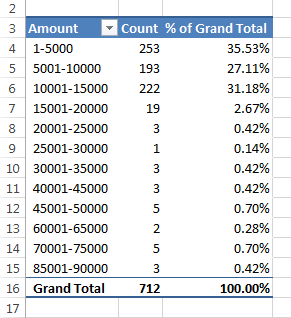 Click any cell in the last column and choose Shows Values as ⇒ % of Grand Total. The table will look like this. 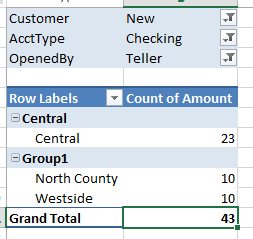 Pivot Table is showing in the percentage of Grand Total. Change the headers name to Amount, Count, and % of Grand Total respectively. This is your final pivot table. The pivot table is in “PT5” sheet. We have changed the sheet name to “PT5” after the creation of pivot table. To find out what types of bank accounts tellers open most is simple. Place OpenedBy field in the FILTERS area PivotTable Fields at first. Now place the AcctType field in the ROWS area in the PivotTable Fields task pane. Now place the Amount field in the VALUES area in the PivotTable Fields task pane. Right-click on any value in the last column and choose Shows Values as ⇒ % of Grand Total from the shortcut menu. Change the header name of the last two columns to Accounts and PCT respectively. Select cell range C4: C7 and apply this conditional formatting: Home ➪ Style ➪ Conditional Formatting ➪ Data Bars ➪ Gradient Fill ➪ Green Data Bar. Click OpenedBy drop-down list and choose Teller. The pivot table is in “PT6” sheet. We have changed the sheet name to “PT6” after the creation of pivot table. Read More: What is a Pivot Table in Excel – Make a Pivot Table Manually! To achieve this pivot table, we shall learn how to combine two columns into a pivot table. Drag the AcctType field is in the Rows section. 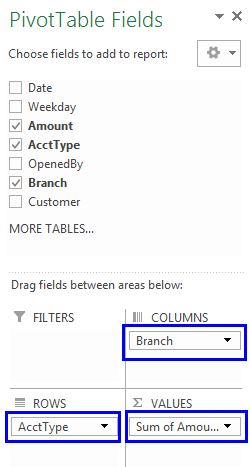 Drag the Branch field is in the Columns section. The Amount field is in the Values section. You will get a pivot table like this. Now select both North County and Westside columns and right click and choose Group from the shortcut menu. This will combine these two branches into a new category (Group 1). Grouping also creates a new field in the PivotTable Fields task pane. In our case, the new field is named Branch2 in the PivotTable Fields. 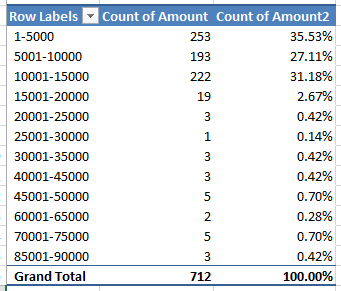 You can change the label in the pivot table to Other Branches. After grouping the North County and Westside branches, you can now easily compare between the Central branch and the other two branches. See the following figure. Pivot table when grouped two branches and transformed into one. We want to add a chart for easy comparison. Choose PivotTable TOOLS ⇒ ANALYZE ⇒Tools ⇒ PivotChart ⇒ Clustered Column chart. We have got our desired Pivot Table. Look at this. This pivot table and pivot chart compare the Central branch with the other two branches combined. The pivot table is in “PT7” sheet. We have changed the sheet name to “PT7” after the creation of pivot table. Drag down the Customer field is in the Filters section. Place the OpenedBy field is in the Filters section. Now place the AcctType field is in the Filters section. Drag the Branch field is in the Rows section. 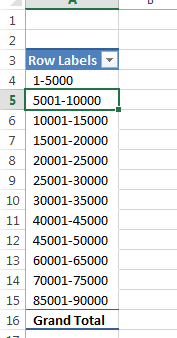 Place the Amount field is in the Values section, summarized by Count. We have to use three REPORT FILTERS in this pivot table. We have filtered the Customer Field to show only New, OpenedBy field to show only the Teller, and the AcctType field to show only Checking. See the following figure. This pivot table uses three Filters. The pivot table is in “PT8” sheet. We have changed the sheet name to “PT8” after the creation of pivot table. For PT8, the title asks for the savings account whereas the example is filtering for only checkings. Otherwise great tutorial. hi kawser, thank you for your work its wonderfull!! i learned a lot cheers! more power! Thank you a lot. Found what I was looking for.